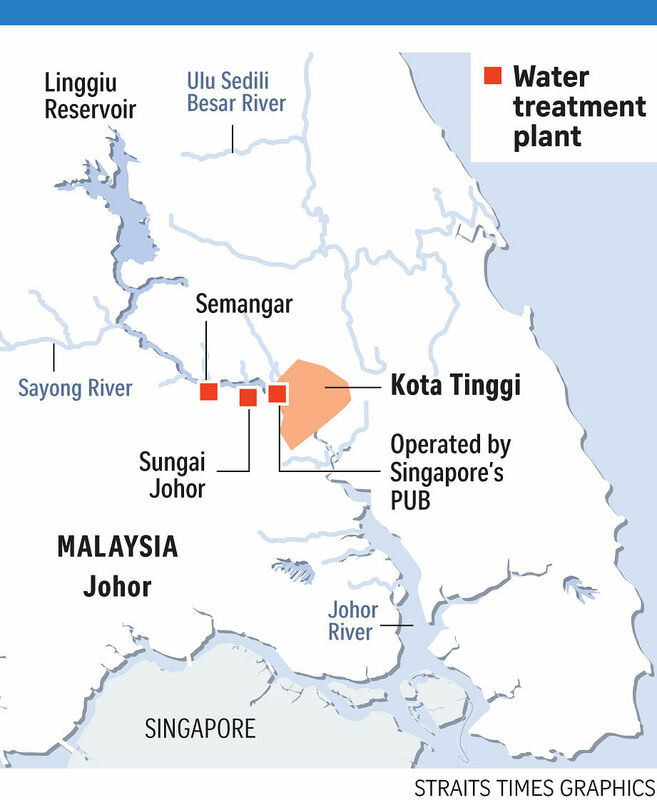 Johor is studying plans to divert water from two rivers to the Linggiu Reservoir to reduce water shortage that has hit the state's east coast districts around Kota Tinggi in the last few years, officials say. The plan to boost water levels in the reservoir should be a boon for water treatment plants downstream operated by Johor and one operated by Singapore's national water agency PUB. This year's dry spell has reduced the water level at the Linggiu dam to an unprecedented 35 per cent last month, raising fears over whether Singapore can continue to rely on Malaysia for the agreed 250 million gallons per day (mgd), or nearly 60 per cent of its current water needs. The reservoir was 80 per cent full at the beginning of last year. The Linggiu Reservoir, built upstream of the Johor River in 1994, collects and releases rainwater into the river. The reservoir is located north of Kota Tinggi town. Johor's Cabinet member in charge of public works, Datuk Hasni Mohammad, told The Straits Times the state is looking at building facilities at Sayong River and a dam at Sedili Besar River to divert water into the Linggiu Reservoir. "Given the situation we are facing now, the effort to improve the yield from Johor River is by various water transfers, and not just by cloud seeding," said Mr Hasni, Johor's Public Works, Rural and Regional Development Committee chairman. Under Malaysia's political system, water, religion and land issues are broadly under the purview of the respective states. But the 13 states' chief ministers often liaise with federal authorities to ensure smooth implementation in these matters. The proposal for the Sayong River catchment includes building a weir - a low wall across the river - to channel about 50 mgd water into the Linggiu, Mr Hasni said. "This is the cheapest way of stabilising the capacity at Linggiu dam," he said, adding that it would cost about RM250 million (S$84.5 million). For Ulu Sedili Besar River, a proposed RM660 million dam is awaiting approval by the federal government under Malaysia's current five-year economic blueprint. Preliminary expectations are that 110 mgd will be available from this river for transfer to the Johor River as well as two nearby Johor treatment plants, he said. Either of the river projects would take at least two years to complete. Mr Hasni had on Sunday said that Johor will honour the water agreement with Singapore - that expires in 2061 - to allow PUB to draw and treat 250 mgd of raw water despite local pressure to cut off the supply and divert it for local needs. A former Johor government official told The Straits Times the ruling Umno party in Johor has repeatedly asked the federal government to review the water agreement. Water rationing has been carried out since last month in the Mersing and Kota Tinggi districts, affecting some 85,000 people.